Thomas Reddall High School is a public coeducational high school in the suburb of Ambarvale, New South Wales, Australia. The school was founded in 1991, with its first class completing the Higher School Certificate in 1996. Prior to 1991, the site of the present school was occupied by Ambarvale High School and made up entirely of demountable classrooms. Ambarvale High School was relocated to the suburb of Rosemeadow. 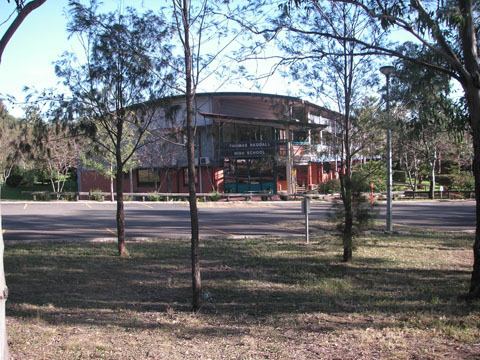 As a result, despite its name Ambarvale High School today predominantly serves the suburb of Rosemeadow whereas Thomas Reddall High School predominantly serves the suburb of Ambarvale. The school is named after the Reverend Thomas Reddall, the first Anglican clergyman appointed to Campbelltown. Reddall supervised the construction of nearby St Peter's church in Campbelltown and lived in what is now the suburb of Glen Alpine, which forms part of the school's catchment area.